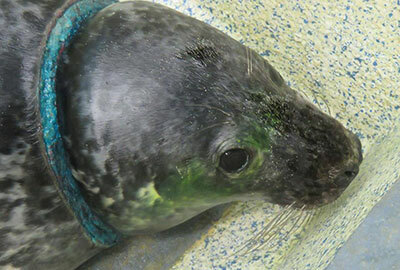 Beast, four months old male grey seal pup, was rescued from the beach at Porthgwidden in St Ives on 16th January 2015 at 6.30am in the morning by Tim Bain and Dave & Lesley Jarvis, members of the British Divers Marine Life Rescue (BDMLR) team. Click here to watch the rescue of this pup filmed by Tim Bain. Tim Bain had spotted the seal the night before on Bamaluz beach (St Ives) hauled out, he was pleased that the seal was on Porthgwidden beach, this time Tim with the help of Dave and Lesley managed to capture it. 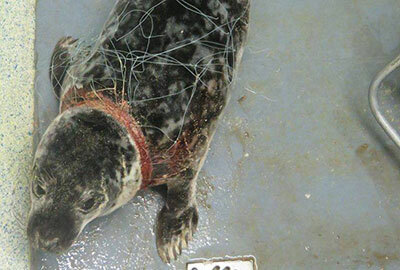 The pup was entangled in the net which had cut in quite deeply and showing signs of infection around the neck. 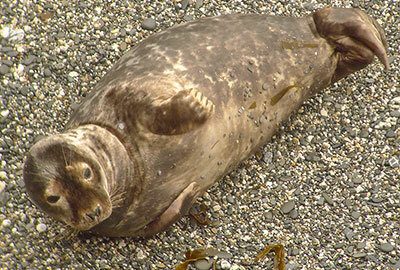 © Photos above and left of Beast are courtesy of Sue Sayer of the Cornwall Seal Group Research Trust. Update - 23rd January 2015 : Beast now weighs 27.5kgs, he is currently in the hospital and having a swim every day and is looking great. He is eating fish for himself. In the next few days this pup will hopefully be moved down in the outside nursery pools for his next stage of rehabilitation. Nearly forgot to mention, Beast is quite feisty and very vocal. Beast´s flipper tag number is 075 (yellow). Update - 17th March 2015 : Beast was released back into the wild along with Spongebobby, Hong Kong Phooey and Iron Man on 12th March 2015. 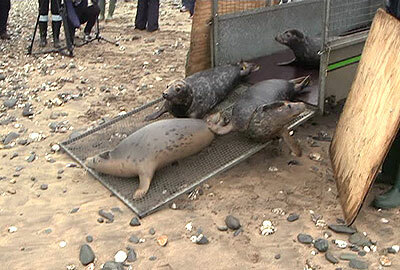 Click here to watch a short video package of the seal release by BBC Spotlight South West Country TV. 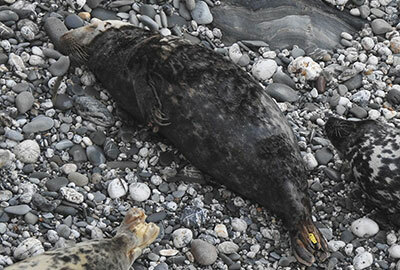 Click here to read Sue Sayer of the Cornwall Seal Group Research Trust´s press release, who will monitor this seal´s progress back on the wild. Click here to see a larger photo (left) of Beast taken by Sue Sayer on 28th March 2015. 28th September 2017, 9th, 13th & 20th November 2017, 14th & 28th December 2017, 1st, 4th & 22nd January 2018, 8th, 15th, 19th & 26th March 2018, 9th April 2018, 10th May 2018, 6th September 2018, 9th, 11th, 17th, 18th & 30th October 2018, 12th November 2018, 17th & 24th December 2018 and 2nd, 3rd, 10th & 17th January 2019 and 4th, 7th, 14th, 18th & 26th February 2019. Click here to see a larger photo (right) of Beast taken by Sue Sayer on 28th December 2017.